St. Matthew’s Evangelical Lutheran Church can trace its founding to when several German farm families in the area met in September 1885 to begin efforts to call a pastor. They contacted Rev. Vollmar, pastor of St. Matthew’s Lutheran Church of Penn Township, who consented to assist. The first worship services were held in a nearby district school house just west of the church. Due to other ministerial commitments, Rev. Vollmar resigned and Rev. Frey of the Lutheran Church in Moltke Township agreed to conduct services every third Sunday of the month. Rev. Frey was followed by Rev. Heuer of Penn Township who, in turn, was succeeded by Rev. Buerkle of Bismarck Township. On May 16, 1887, and still worshiping in the school house, the parishioners voted to construct a church measuring 24x36. Work on the building, a wood structure, was to have begun after the fall harvest but was delayed until the following spring. In September 1887, Rev. Mueller of Penn Township agreed to provide services every two weeks as well as catechism instruction. Under Mueller’s guidance, the families united into a congregation and took the name of St. Matthew’s Evangelical Lutheran Congregation of Round Grove Township, Ohio Synod. They also drafted and adopted a constitution. The first church was completed in 1888 at a cost of $800. The contractor was Mr. Lucas of Bismarck Township. Land for the cemetery was also purchased that year. Charter members included: August Witte, A.F. Fleisch, H. Proehl, F. Fenske, Herm. Draeger, August Roepke, Wilhelm Schiro, F. Schuft, and Herm. Schwartz. The first to serve on council were: H. Proehl, F. Fenske, and A.F. Klitzke. Several others joined prior to the church being constructed: F. Kaping, F. Kalisch, Carl Ortloff, Rob Klitzke, Wilh. Grams, A Tafelmeyer, and Wihl. Brede. Rev. Mueller had served a little more than a year when the congregation called its first full-time pastor, Rev. B. Ehwaldt. He was installed on October 21, 1888. On February 15, 1889, the congregation voted to build a parsonage measuring 18x24, 14 feet high, and with a 14x10x10 basement. It was completed in 1890. Rev. Ehwaldt resigned on February 3, 1890. Rev. Schreiner of Bismarck Township served as interim for a six-month period when the congregation called Rev. I.E. Wuebben of Armstrong, Minnesota, in November 1890. During his ministry, the pastor’s salary was increased from $300 to $350, plus fuel and feed for the horses, and each member providing a quantity of wheat. The congregation was incorporated at this time. Rev. Wuebben also served a congregation in Grafton Township and other preaching points as far away as Buffalo Lake and Hector. He organized two other congregations, one in Stewart (St. Paul’s Lutheran) and Hector. Rev. Wuebben served St. Matthew’s Lutheran Church until January 15, 1895. During his tenure the congregation grew from 26 to 30 members. Pastor Schimel, a seminary student, served as interim for a three-month period until Rev. George Gehrke of Clintonville, Wisconsin, was installed in March 1895. The church debt of $300 was paid off and a new organ purchased in time for Christmas services 1895. Rev. Gehrke served until July 2, 1899, when he was called to Big Woods, Minnesota. In 1899, an addition was built onto the west side of the parsonage measuring 16x28. Rev. Edward Schlagdenhaufen of Woodville, Wisconsin, was next called to serve. He was installed by Rev. George Diemer of Penn Township on September 17, 1899. The congregation grew under Pastor Schlagdenhaufen. On November 2, 1901, the congregation voted to build a new church. After a year’s delay, a plan by Mr. Karl Webster of Winthrop was put into place with construction completed in 1902. The building measured 36x56 feet. The chancel and bell tower added another 19 feet to its length for a total of 75 feet. Members of the building committee were: H. Proehl, F. Rose, and F. Fenske. Mr. Webster was given the contract to build on April 16, 1902. The cornerstone was laid on June 22, 1902. Contents of the cornerstone included a copy of the church paper of the Ohio Synod, a copy of the daily German Volkzeitung, a copy of the Synodical Kalender, a history of the congregation, and three coins. The cost of the church was $10,000. Church membership in 1902 was 61 families. Shortly thereafter a bell was purchased and installed. It would be rung at 6:00 pm on Saturday evening to announce the Sabbath, on Sunday morning one hour and one-half hour before worship, and once more at the start of the worship service. The church would toll the bell during the Lord’s Prayer and funeral services. The bell measured 80 inches round and four inches thick. The clapper is 17 inches round. The church was dedicated on November 2, 1902, with Rev. Schlagednhaufen officiating. He was assisted by Dr. H. Ernst, Rev. Gehrke, and the Revs Kiemer and Kettner. Dr. Ernst delivered the morning sermon. At the afternoon service, Rev. Gehrke spoke on Psalm 87:1. Rev. Kettner then addressed the church on the words of Matthew 17:4 “Lord, it is good for us to be here”. The weather however was unfavorable that day and the offering was only $64. The church council at this time consisted of President: August Witte; Deacons: August Brede, Carol Grams, H. Fleisch; Trustees: Albert Hehrke, Fr. Fenske, Fr. Rose; Secretary: A.F. Klitzke, and Treasurer: Job. Fenske. During a severe thunderstorm on the night of August 14, 1906, the roof of the church was struck by a “cold” lightning bolt. Just previous to this many members of the congregation were visited by a severe hail storm which destroyed their standing crops. Again, In June 1907, the church steeple was struck by lightning with the damage amounting to $245. On May 3, 1908, Rev. Schlagdenhaufen resigned due to ill health and accepted the position of house-father at Luther Seminary in St. Paul, Minnesota. Rev. Christian Langholz of Good Thunder, Minnesota, was installed by Rev. G. Diemer on October 4, 1908. Rev. Langholz served until May 24, 1914, when he accepted a call to one of his former parishes near Lamberton, Minnesota. In a meeting on June 1, 1914, the congregation extended a call to Rev. K. Haerle of Anamoose, North Dakota. He was installed on July 12, 1914, by Rev. Peter Mueller of Bismarck Township. In 1915, the congregation purchased the current pipe organ at a cost of $785 from Hinners Firm in Pekin, Illinois. The organ was dedicated on February 14, 1915, with Prof. A. Moench of Luther Seminary delivering a concert, but attendance was small due to icy road conditions. In the spring of 1917, the congregation sold two acres of land east of the church to Mr. N.O.Burke for $300 and bought seven acres of land at a cost of $125 per acre from Mr. John Stockmann Sr. In 1919, a new fence was built around the cemetery, and the church was painted inside and out by Schuster & Schwendinger of New Ulm at a cost of $1,100. Rev. Haerle served until May 1, 1927. His successor was Rev. Adolph Rink of Clara City. Rev. Rink was installed by Rev. Mueller of Bismarck Township. The present parsonage was built in 1927. A section of the old parsonage was moved onto the church grounds, northeast corner of the parking lot, where it served as a place for religious instruction until 1969. The building committee for the parsonage was Mr. Carl Klug, William Penk, Otto Doerr, William Schwartz and Fred Brede. On January 7, 1935, the congregation voted to have services in English once a month on the last Sunday of the month. The 50th anniversary of the church was observed on September 15, 1935. Guest speakers were Rev. Herbert Brede, son of the congregation, and Rev. Max von Fischer. The church roof was re-shingled in October of 1936. Rev. Rink served until May 1, 1936. Rev. G. Bents of Almena, Wisconsin, was called on June 10, 1936. Rev. Mueller, assisted by Rev. Striepe, installed Pastor Bents. The church was equipped with electric lights and redecorated in October 1937. During the pastorate of Rev. Bents, Bible School was held for a six-week period each year and most of the children in confirmation continued to attend public school after their two full years of instruction. Rev. Bents served the congregation until September 1943. Rev. Fred Lehne of Glenwood City, Wisconsin, was installed on October 31, 1943, by Rev. M. Knoll who was assisted by Revs Wm. Mueller and Otto Lindekugel. Services were conducted in both German and English every week with Sunday School between the two worship services. On January 12, 1944, and with 23 charter members, the Ladies Aid was organized. From 1944 to 1945 the east balcony stairwell was closed off so a stairway down to the east entrance door and basement could be constructed; the church basement was remodeled with a kitchen and restrooms; a septic tank, sewer and water lines were laid. Rededication services for the basement were held April 15, 1945, with Revs Ernest Lehne and Max von Fischer delivering sermons. The congregation joined the newly formed American Lutheran Church (ALC) in 1945. The constitution was translated into English and made available to each member in booklet form. In 1947, the parsonage was repainted and a fuel-jet burner installed in the church’s wood/coal burning furnace. In 1948, new offering plates were purchased to replace the “Klingelbeutel” collection bags, and one acre west of the cemetery was purchased. By the end of the decade, the practice of men sitting in the pews (with the hat clips) on the right side of the church and women and children on the left had waned. On January 2, 1950, with the structure now nearly 50 years old, improvements were made to the church interior. The following, together with the church council, served on the Improvement Committee: Fred Schuft, Glendon Brede, Walter Rickheim for the storm and stained glass windows; Herbert Doerr, Martin Schwartz, Stanley Rushmeyer for the wiring and new light fixtures; Herman Schiroo, Roland Schwartz, and Otto Doerr for the re-plastering and redecorating; and a council Trustee for the new chancel rug and tile floor. Serving on Council at this time were Wm. Fenske, Emil Husfeldt, Herman Schiroo, Ervin Roepke, and Arnold Proehl. Cost of the improvements totaled $14,784. Membership in 1950 was 240 confirmed and 336 baptized. As of 1950, there had been 719 baptisms, 548 confirmations, 167 marriages, and 173 burials. In 1954, a fuel oil furnace replaced the coal burning unit in the parsonage. In 1960, the church joined a reorganized ALC and the Ladies Aid became the American Lutheran Church Women or ALCW. A curb and gutter system was constructed in front of the church and cemetery in 1961. After 20 continuous years of ministry at St. Matthew’s Lutheran Church, Rev. Lehne accepted a call in 1963 to Wells, Minnesota. Rev. Ed Domke of Hutchinson would serve as interim until the congregation called Rev. B.J. Engskow from Belgrade, Minnesota. He served the congregation from 1964-1973. The parsonage was remodeled in 1963. The colonnades in the living room were removed and new wall-to-wall carpeting installed. The eight-stall horse barn behind the church was dismantled and removed. In 1967, the congregation purchased the red Service Book and Hymnal of the ALC. In 1969, due to declining membership, the congregation sold the schoolhouse to Linus Fischer who relocated the structure from the northeast corner of the church parking lot to his farm southwest of Fernando. Also that year, 1969, the church interior was repainted and stenciled. In 1971, the furnace in the church was replaced with a fuel-oiled heating unit. With Rev. Engskow’s pending retirement, the congregation called Rev. Clarence Muske from Mapleton, Minnesota, who was installed on August 5, 1973. The parsonage was insulated that year, new storm windows and screens purchased, and kitchen windows replaced. A row of conifers was planted along the north property line and western edge of the cemetery. 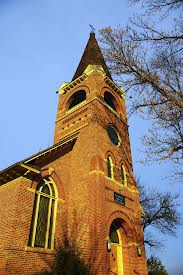 In 1977, the church was tuck-pointed, wood trim pained, steeple repaired, the church roof was insulated, and the church constitution was changed to allow women to vote or hold office. In 1978, the wood trim on the church was replaced and the barn roof re-shingled. Rev. Muske retired in May 1979. Pastor Tim Maland, a graduate of Luther Seminary, was called to serve. He was installed the same Sunday Rev. Muske gave his farewell sermon. The “green hymnals” (Lutheran Book of Worship) were purchased in 1979. Rev. Maland started an ecumenical summer Vacation Bible School. In 1980, the congregation realigned the cemetery stones and repaired the headstones in the oldest section of the cemetery at a cost of $3000. Also in 1980, the church was re-shingled and new carpeting installed. Rev. Maland accepted a call to Faith Lutheran in Hutchinson in 1982. Pastor Mark Gilderhus then served from July 25, 1982, to December 1984 when he accepted a call as an associate pastor in Redwood Falls, Minnesota. Pastor Martha Halls had been serving as interim since January 1985 when on April 10, 1985, she was extended a call as a two-thirds time pastor. She was installed June 1985. Rev. Halls lived in Winthrop, Minnesota where her husband, Rev. Marcus Kunz, served as pastor for Peace Lutheran Church. The parsonage remained empty except for the study, which was used by Rev. Halls as an office, small group meetings, and bible school. Rev. Halls was the first woman pastor of St. Matthew’s and one of the first women pastors in the Southwestern Minnesota Synod of the ALC. In May 1984, the centennial committee began its work planning for the celebration of the 100th anniversary of the church. The theme chosen was “Century of Grace.” On September 23, 1984, the church held a “kick-off” hog roast, potluck dinner, bake sale, and auction that raised $5,554 for next year’s two-day event. Saturday, September 14, 1985, was “Confirmation Reunion Day” with a 9 a.m. German Worship Service led by Pastor Schulz, a 10:30 a.m. English Hymnfest and Confirmation Reunion Service led by Pastor Gilderhaus, a Hog Roast and Potluck dinner, and afternoon recreational games and contests. Sunday, September 15, 1985, was “Centennial Birthday Celebration” with a 10 a.m. English Worship Service led by Pastor Muske, a catered noon meal, the ringing of the church bell 100 times, a 2:00 p.m. Youth Service with Pastor Maland, and a Cake and Ice Cream Social. Several items were added to the cornerstone that day. In 1985, there were 60 pupils in Vacation Bible School and 35 in Sunday school. The ALCW sent 48 quilts to Lutheran World Relief and a Centennial Banner they had sown. The congregation affiliated with the Evangelical Lutheran Church in America (ELCA) in 1988. Pastor Halls resigned September 1989. Pastor Bob Miner served as interim from September 1989 to August 1990, and the ALCW became the Women of the ELCA or WELCA. The congregation called Pastor Elizabeth Strenge in 1990, who served until January 1994. Rev. Chuck Beronius served as interim until Rev. Douglas Locken accepted a call in July 1994. He served until June 1997. Pastor Locken was followed by Pastors Andrea Olson (August 1997 to August 1998), Jim Meyer (August 1998 to December 31, 1998), Steve Josephson (January 1999 to August 1999), and J. David Nelson (September 1999 to December 1999). In 1998, the electrical in the church was upgraded with a 200 amp service, the church interior was painted, the balcony floor refinished, steeple reinforced, and the outer wood trim painted. In 2000, the parsonage was resided with steel by Alsleben and Draeger Construction, and Jane Gehrke and Velda Quandt oversaw the update and reprint of the “Fernando Favorites” cookbook which had been first published in 1981. Pastor Janet Carlson began her ministry on January 1, 2000. Pastor Carlson led youth trips to Camp House on the north shore of Lake Superior and to Sky Ranch in Colorado. The confirmation students attended Confirmation Camp at Green Lake Bible Camp. Several members worked on maintenance projects at the Shores of St. Andrew’s near New London, Minnesota. Vacation Bible School raised money for mission projects. A Cemetery Committee was formed to care for the graveyard. During Pastor Carlson’s tenure, the congregations of St. Matthew’s and St. John’s Lutheran Church of Bismarck Township formed a two-point parish. Pastor Carlson lived in the parsonage of St John’s. The parsonage of St. Matthew’s remained unoccupied from 2000 to 2006. Pastor Carlson served both congregations until September 2002 when she married and moved to California. Rev. Robert Johnson became interim pastor in November 2002. A call was extended to Pastor Johnson by the parish, which he accepted. He commuted to and from his home in Victoria, Minnesota. He led a weekly adult bible study, taught confirmation classes, conducted visitations, and planned trips for both adults and youth. He was also actively involved in Via de Cristo. During Rev. Johnson’s pastorate, WELCA voted to be a non-affiliated gathering and subsequently adopted the group name “Women of the Word” or WOW. High-rise toilets were installed in the church basement restrooms in 2004. In 2005, new windows were installed on the main level of the parsonage. In 2006, the carpet in the church bathrooms was replaced with tile, and the fuel oil furnaces in the parsonage and church were replaced with three new gas-fired heating and A/C units, one for the parsonage and two for the church. The upstairs and basement units for the church were installed in the old coal room. The fuel oil tank in the church was removed and organ blower relocated in its place. New upstairs parsonage windows were installed. Pastor Johnson served the two-point parish of St. Matthew’s and St. John’s until his retirement from the ministry in July 2006. Pastor Debra Dinda succeeded Rev. Johnson and moved into the parsonage of St. Matthew’s in September 2006. She was installed on May 21, 2007. In 2007, the church kitchen was remodeled and enlarged and a new sound system installed. In 2008, the church was tuck-pointed and steeple re-shingled. The bathroom on the main floor of the parsonage was remodeled with a tub and shower combo, new flooring, electrical and plumbing. In 2009 and 2010, the exterior wood trim and windows of the church were painted; both sets of double-exit doors in the basement were replaced with insulated double-doors; and the basement floor epoxy coated. District of LCMC, and the two-point parish with St. John’s was dissolved. In 2011, the living and dining rooms, hallway, and back bedroom on the first level of the parsonage received fresh coats of the paint, as did the old carriage (car) shed. New light fixtures were installed in the living and dining room. Also, the wood floors on the main floor of the parsonage were sanded and refinished. The congregation was well served by a host of Supply Pastors from June 2011 until Rev. Aaron Albrecht’s arrival February 1, 2012. Rev Albrecht and family moved into the parsonage June 2012. A major undertaking in 2012 involved repairing the damage to the church steeple incurred during a spring thunderstorm. Those repairs included weather-proofing the corner moldings and trim around the base of the steeple. Additionally, the trees around the church property were trimmed, barn painted, the barn and car shed reroofed with steel, the east entrance door and lock of the church were replaced, and individual pew cushions obtained. Council members were: President, Douglas Proehl; Secretary, Norine Roepke; Treasurer, Emilie Wildey; Deacons: Mitch Stockmann, John and Mavis Renner, Trustees: Wayne Burke, Dale Wildey, and Ted Burke. In 2013, covering the fascia and soffits of the church with aluminum was completed in the spring by KWAM construction. Also, a new sacristy door was installed by RA Schuft Construction. The well, which provides water for both the church and parsonage is tested annually by the state, required sanitizing. In November 2014, for the 130th Anniversary next year, the sanctuary, main entry, stairway up to the balcony, and bell tower room were repainted. This work was done by Tim’s Painting of New Ulm. The well, which provides water to the parsonage and church, needed sanitizing twice during the year. The belfry floor was recoated and new 4-inch PVC drain installed. In January 2015, the electrical wiring and service in the parsonage was brought up to code by Hutch Electric. Pastor Albrecht leads a weekly adult bible study and the Sunday morning Adult Forum, provides confirmation instruction, conducts visitation, participates in the local radio ministry and yearly Theological Conference. For the past decade-plus, parishioners continue to prepare a monthly breakfast open to all every third Thursday and WOW, who meets the third Wednesday of the month, continues to host and sponsor an annual Advent Party for the community that includes entertainment, games, and lunch. During the 130-year history of St. Matthew’s, two sons of the congregation have been ordained into the ministry, Rev. Herbert Brede (ordained in 1920, retired in 1970) and the Rev. Dr. Mark Bents, ordained in 1976. The Fall Festival, Hog Roast, Auction, and Confirmation Reunion, begun in 1984 and still held the third Sunday of September, continues to be a great homecoming celebration for past and present members of St. Matthew’s Lutheran Church, their friends and relatives, and surrounding community.